"I have an immense love for nature and truly enjoy being outdoors. It is hard to describe in words how I feel when I am out there enjoying beautiful scenery all around me, but my camera allows me to translate some of my feelings into images. Through my photos, I hope to inspire others to go out there and explore the beauty of our world. Earlier this year I took a 10-day solo trip through the desert to photograph some of the most iconic places of the American Southwest with my very first full frame camera. 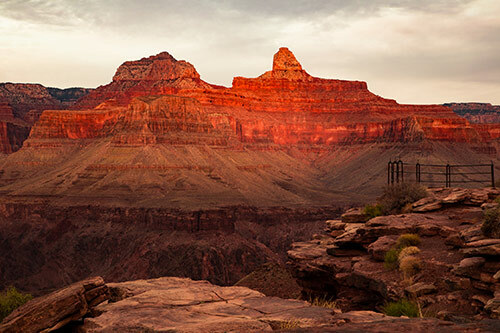 I shot this photo at Plateau Point, a great viewpoint accessed from the Indian Gardens campground on the Bright Angel trail inside the Grand Canyon. I was out there all alone enjoying the sunset as I listened to the Colorado River rush through the canyon just 1,300 feet below me. I set up my camera and waited for that magical moment during twilight when reds, oranges, and yellows become their most vibrant over the rock layers of the canyon walls." EQUIPMENT: Canon EOS 6D DSLR Camera & Canon Zoom Wide Angle-Telephoto EF24-105mm IS f/4 L USM Lens. "I was on a Red Bull Photography workshop with Michael Clark and Creative Live at Smith Rock State Park in Bend, Oregon. 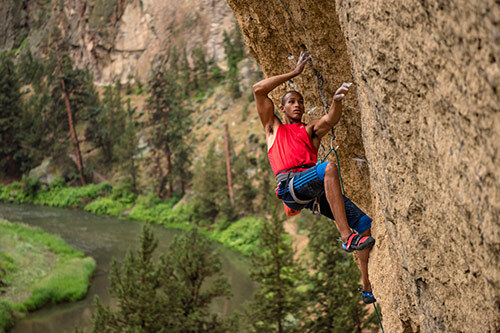 Kai Lightner is the athlete in the photograph and he is a prodigy in his sport of climbing. He is known for his indoor competition climbing, but he can climb almost anything. This was his first time on the route, called "Rude Boys." Lightner is casually performing a move called "The Rose." Michael Clark was demonstrating some hi-sync lighting techniques to some students during this workshop. Instead of shooting where he was, I decided to climb up a steep hill to get a different angle, resulting in the photo you see here. My goal was to position Kai in the frame where the background would enhance the feeling of his height on the rock while seeing the emotion on his face. I try to keep myself well rounded so I can shoot almost any subject and not miss that moment. I use a quiver of cameras - from my two large format 4x5's from the 1930's, to my first SLR (the Pentax Asahi), to my Nikon D810 and beyond. Each camera offers a different style, look and feel that helps me achieve my thought, goal or mood." EQUIPMENT: Nikon D810 body and the Nikkor 24-70mm f2.8 @ 70mm focal length, f2.8, 1/60, and ISO 400. 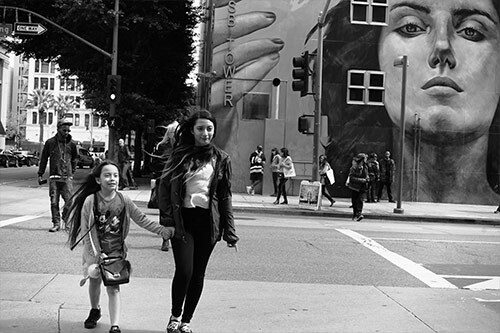 "As part of Ed Mangus' assignment for Street Photography, I sought an image that would capture the gritty urbanism, artistic beauty and cultural diversity of downtown Los Angeles. The image's background is framed on the right by a large mural of a woman and on the left by a gentleman onlooker while in the foreground a young lady who bears a striking resemblance to the mural lady and a child go through the crosswalk hand-in-hand." EQUIPMENT: Sony A 7 R ii full frame digital mirrorless, 45mm Zeiss Planar prime lens, adapted from Contax G2 rangefinder film camera, F8, pre-focused with zone focusing.